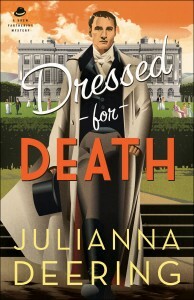 Having read Rules of Murder a few years ago, when I had the opportunity to check out the latest in the Drew Farthering Mystery series by Juliana Deering, Dressed for Death, I snatched it up. I think perhaps jumping straight from book 1 to book 4 has caused me some issues. I felt as though I was expected to know some of these characters (even secondary characters), their relationships and quirks before I opened the pages of this book. Truly, I think there is a way for authors to neither bore their followers nor leave new readers in the dark, so I was somewhat disappointed that I felt like the new person in the Farthering world, unaware of who the players were. 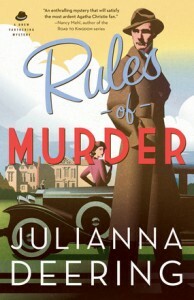 The new novel Rules of Murder by Julianna Deering presents the affable, young country gentleman Drew Farthering in his first attempt at solving a murder. During a soiree at his family home, a man is murdered and Drew embarks on a quest to use the knowledge he’s learned from popular mystery novels to solve this real-life crime. With his best friend, Nick, at his side and the beautiful and intelligent American girl, Madeline, to impress, Drew leaves no stone unturned in his hunt to find the killer. The novel is lighthearted and reminiscent of the popular murder mysteries of the 1930s. However, Deering lost credibility with me along the way as not one, not two, but three murders take place at the Farthering home. The plot leaves something to be desired as clues become almost too obvious to the reader and the mystery is quickly unraveled. The characters are endearing and incredibly likable, perhaps too likable. At times, Drew just didn’t seem realistic–finding out that his mother isn’t who he thought she was (or his father, for that matter) hardly fazes him. And the death of loved ones that he respects and trusts? It provides him with an entertaining mystery to solve, barely making an impact emotionally. That’s just hard to believe. Madeline is purported to be a strong character, intelligent, independent and dogged in her determination, but more often than not she is portrayed as fearful, utterly dependent on others and often satisfied to be left behind. What could have been a winning character simply didn’t impress. And the relationship and budding romance between Drew and Madeline is sweet, but oversimplified. 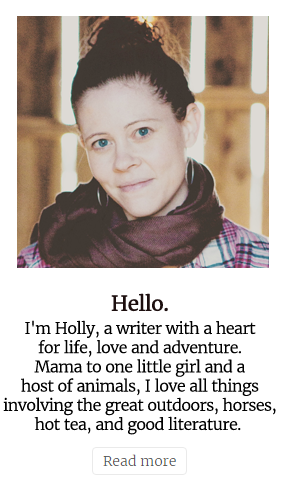 Unfortunately, the characters hardly seem to grow or change at all over the course of the novel, creating a lack of depth. And themes of faith are portrayed only briefly and in terribly cliche moments. In all, Rules of Murder is a lighthearted and fun step back in time, however I hope any forthcoming Drew Farthering mysteries portray evolving characters and more stimulating plot lines. I received a complimentary copy of Rules of Murder from Bethany House Publishers, but I was not otherwise compensated for this review. All writing, thoughts, and opinions are solely mine.